Sculpture is a full featured, professional synthesizer that frankly is more powerful & versatile than any hardware synth you can buy - and it comes with Logic! Thankfully, we have Steve Horelick, a master synthesist, here to show you the way! With his trusty sidekick Igor in tow, Steve strips Sculpture to it's basics before building it back up, step by step, to show you how to synthesize rich and musical timbres that have never been heard before. Sculpture is certainly a synthesist's dream tool. With a depth of programming that could shame any traditional synthesizer and the ability to save and recall your custom patches at any time, Sculpture will become one of the most important tools in your audio arsenal. Steve shows you how to model wood sounds, bells and metallic hits, smooth strings, and so much more ... if you avoid presets like the plague and insist upon uniqueness in your sounds, this is a must watch tutorial program. 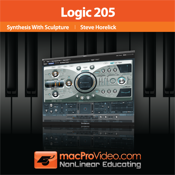 Steve's best-selling tutorials on Sound and Logic's Effects Plugins are a main-stay of our tutorials here at macProVideo.com ... you'll be please to know he brings all of his talents, and also his assistant Igor, to this new tutorial program! In our opinion, this is the best one yet!